Our individual and collective purpose is to pursue the promises of God and God’s purpose it to keep God’s promises. But the most recent financial crisis has made it much more difficult for a growing number of people to adequately pursue and attain the promises of God. This has led to heightened senses of anxiety, insecurity and inferiority as many people face dwindling prospects and limited opportunities for advancement. 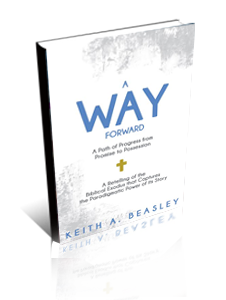 In A Way Forward Keith Beasley retells the story of the biblical Exodus in a way that captures its paradigmatic power and reveals a path of progress that leads toward the promises of God. Combining self-help with spiritual insight and social responsibility Keith Beasley contends that we have to be willing to undergo personal change in order to qualify ourselves for promotion. But when personal changes are not enough because of policies and procedures, perceptions and prejudices that effectively work against us we have to believe that God will intervene in order to liberate and deliver us from whatever or whoever is impeding our ability to pursue and attain the promises of God. Then, we have to be willing to partner with God and by extension others by actively participating in not only our own liberation and deliverance but that of others as well. In the end, we’ll not only glorify God by pursuing and attaining the promises of God but we’ll become living manifestations of God who take on the interventionist’s character of God. A way forward is available, progress is achievable, and the biblical Exodus is a roadmap. Read A Way Forward, and begin moving toward the promises of God!